In February, Walmart and Sam’s Club were recognized by Children’s Miracle Network and Children’s Health for their partnership which started in 1987. A total of 113 Walmart and Sam’s Clubs in Dallas and surrounding areas fundraised for Children’s Health. Walmart and Sam’s Club raised over $550,000 in 2017, which marked the 30-year partnership between Walmart and Sam’s Club and CMNH. 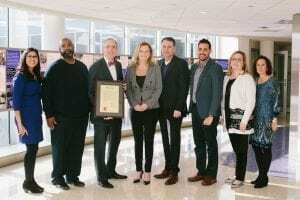 This achievement was celebrated along with guests of honor from Sam’s Club regional leadership, market managers, Darryl Duncan and Jeff Thompson, the President of the Children’s Medical Center Foundation, Brent Christopher, and CMN Central Region Vice President, Barbara O’Regan. Honored guests were presented with a signed proclamation from Senator Royce West. A plaque recognizing Walmart and Sam’s Club partnership with CMN was also unveiled during the recognition event. The plaque is now placed in the reception area of the Children’s Health Surgery Center.